Which Languages do we speak? Figured we can have some fun, learn a little more about one another. I also really have a habit of learning a bit of the language, a lot of words, but then really giving up when it comes to the grammar. I attribute this to the fact that I don't really remember learning grammar at school in English, and the grammar is generally so simple that you can kind of pick it up without making any conscious effort. Not so in other languages, I've found. Czech is basically just from practise and being forced to use it on a regular basis. French is at the level it is because I had to learn it at school, didn't really appreciate it but with all the French loanwords in English, I find that it stays somewhat fresh. Dutch and Hungarian, I learnt a lot of phrases before planned holidays but never really got to use them. That said though, I have a trip to Holland coming up, so perhaps I can try it. Also the current girfriend speaks Dutch and having a private language is always handy. German, I had two girlfriends who didn't ever want to practise with me. That and I could never remember which die der das belonged to which word so stuck at Beginner. The other slavic languages are from friends, mostly just swearing and drinking times. Re: Which Languages do we speak? Polish is my native language. I don't speak any other Slavic language, but due to the similarities between the three, my Polish helps me understand the general gist of what a person means when they speak Czech or Slovak. I've tried to understand people speaking Ukrainian or Russian on occasion, but that's a bit too far. I can sort-of make out a few words here and there, if I'm lucky. I studied French for quite a few years in school at then some more at the university. I forgot more knowledge than I retained, sadly. I understand written French perfectly well as long as I have a dictionary handy to check a few words here and there. Spoken French is tougher, I struggle to understand anything more than simple conversations, but if I talked to someone who speaks slowly and patiently, I'd probably manage. On the other hand, I wouldn't be able to speak or write in French beyond the VERY basics. Mostly due to how complex French grammar is (said the Polish guy...). I plan to re-learn the grammar, though, and expand my vocabulary, because I feel like much of the knowledge is still in my brain, buried deep, and I could speak decent French if I put a few hundred hours of work into it, to refresh my existing skills and fill in the gaps. Since (written) Spanish is pretty similar to French, I could probably grasp the basic message of a simple text due to similarities of vocabulary, if I strained. That'd be even trickier than trying to understand Czech or Slovak, though. I studied German for three years in High School. I can understand a few words and maybe read a few simple sentences based on mostly guesswork. Not much beyond that, though. I'm thinking, in addition to re-learning French, about learning Korean. I even learnt the entire alphabet once, as a tentative first step (it's super-simple as writing systems go and much more logical than ANY other writing system I've ever seen, I literally learnt it in an hour or two... then promptly forgot everything due to not practicing even once). Lack of time keeps getting in the way, though. Also, I love to pick apart the grammar and etymology of languages I don't speak (reading Wikipedia articles about the grammar of random languages is something I do surprisingly often). Also, to learn songs in languages I don't know a single word of. I'm weird that way. I attribute this to the fact that I don't really remember learning grammar at school in English, and the grammar is generally so simple that you can kind of pick it up without making any conscious effort. Not so in other languages, I've found. It's not actually due to the simplicity of the grammar. If English is your native language, that's what the difference is between learning a language and acquiring it, according to some theories in linguistics. Languages acquired early in life are not picked up as a skill, but an almost innate ability that our brains are hard-wired to pick up. It changes later in life, that's why you have to pick up theory and rules and learn exceptions by heart in foreign languages. That's also the reason why uneducated people can always speak their own language grammatically, correctly and with no effort. Their brains don't need to "learn" much, when the person is young enough that the language "settings" of the brain have not... solidified yet to match their native language (or languages). I have the same experience in Russian, with the advantage that I have a small vocabulary from the aforementioned. I also listened to a lot of Kino and looked up the lyrics but not really much help in direct word for word translation. Polish orthography gives me nightmares, but I can make myself understood when spoken, partly from the Czech plus odd bits but I never really studied or tried to. This is definitely my endgame, I'm not intending to go back to Britain... not if I can help it. I was always okay with this at school. Massive amounts of eyerolling in class as the semi-illiterate guy was asked to read a page fo a play by the teacher. Of course these days I get the point, but at the time it was agony. Oh definitely. Definitely. Though I plough more time into the languages I'm trying to speak these days. Still some stuff (Hungarian and Lithuanian grammar, or Sanskrit for non-european languages) is awesome. Interesting. And frustrating. I really hope one day to speak Czech with some degree of fluency and to be fair I can if the topic stays on certain points. Other things however and I'm all at sea. It's just learning vocabulary and grammar day by day for the time being. It's something one has to force themselves through, in my experience. I started picking up English when I was about five, by playing a lot of video games (which were rarely translated into Polish back then). I had English classes throughout most of school, and read a lot, and by the time I was fifteen or so, I knew the English grammar well and had a very large vocabulary. And yet, at the time I couldn't pick up a book and read it without being tired of it soon after. All the skills were there, I just wasn't comfortable enough. Talking in English? That was even tougher. Generally, I spoke English theoretically well, in practice it was super awkward and I sounded rather artificial. I knew all the little gears that power the English language, but I'd had virtually no exposure to natural, "living", idiomatic English. When I started talking to English-speaking people online in my teenage years, at one point something just kinda... clicked. I wouldn't say it happened overnight, but in a few weeks, I went from being very uncomfortable with speaking English, despite knowing it pretty well, to just sort of... speaking in English. So, from not knowing anything to finally something clicking in my head, it took over 10 years, probably closer to 15. I find that happens with a lot of skills, not necessarily just learning languages. You need to reach a certain breaking point where you finally "get" it. It'll probably happen to you at some point, as well. Vocabulary and grammar of Czech will probably at one point just mesh together and you'll quickly grow more comfortable with the language as a whole. Yeah. I'm sure. It helps being immersed and having a relationship and close friends who speak English as a second or third language and their firsts are Slovak and Czech. I have quite a decent command of some idiomatic segments of the language. I can half read a newspaper article, on the right topic... I also swear like a sailor, mutter crude sexual jokes and can order beer and food all night. Living in Brno helped as well in that I picked up the Hantec slang of the area which has some German roots. Words like 'Salina' for Tram (compare, Tramvaj) and Krygl (pint in Hantec, from German) mean my Czech probably doesn't travel well, but I do really nicely in town as long as the topic doesn't get too abstract or philosophical. Yeah. I'm sure. It helps being immersed and having a relationship and close friends who speak English as a second or third language and their firsts are Slovak and Czech. It can help, but it can also hinder. When you have another language to fall back on, you're never *forced* to use Czech, per se, when talking to them. That can slow progress down, a lot. It's not a huge problem, but it helps to keep it in mind. I try to speak Czech in the wilds, to bar staff, people I meet etcetera. There are people I've never spoken English to, even though I know they know it. I do challenge myself somewhat, but yeah, most of my interpersonal in my relationship stuff beyond 'turn on the television' and 'where did you put my lunch' is generally in English alas. It doesn't much help that I usually ask for Slovak/Czech and then look puzzled as hell, prompting a quick reversion. Wow, this forum is impressively multilingual! English is the only language I am fluent in, but I am (painstakingly slowly) making noticeable improvements in my Spanish. I'm assuming it's more common to speak multiple language in Europe than it is here in the states? English and, from what I gather, at least one other foreign language (usually German, French or Spanish) are mandatory in Polish schools. Many people from older generations in Poland speak Russian, because it used to be the main foreign language taught in school. As to other countries - I know from experience/anecdote that most people in Norway speak very fluent English (partially due to their very good school system), and I think it's similar for most other Scandinavian countries. Can't speak for the rest of Europe, but from what I've heard, yeah - there tend to be at least a few years of foreign language classes in schools throughout European countries. 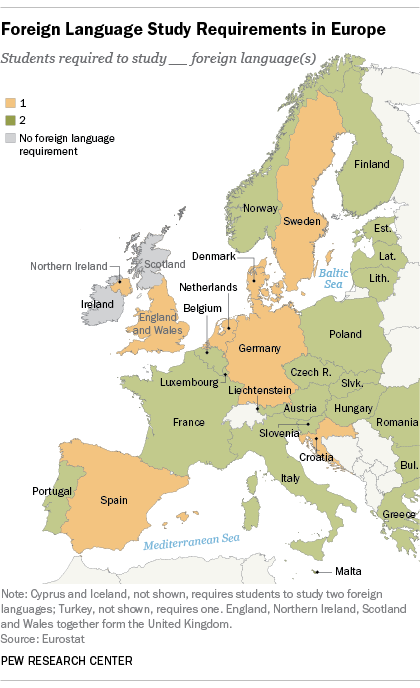 It helps that so many languages are spoken in Europe, so people have an extra incentive to pick at least one foreign language (otherwise you go abroad for, say, holidays and you can't even ask for directions...). In the US or Canada, unless you live in some specific areas, foreign languages are not that useful, and a country like US is so big that I'm assuming many people rarely even leave the country. Plus, there's bound to be some selection bias for this forum specifically, in terms of people speaking foreign languages. If I were a person who doesn't speak English, I wouldn't be reading the comic, or the forum, in the first place . And since English is not the native tongue of most people in Europe, a non-British European forumite is pretty much guaranteed to know at least one foreign language. I think you're right about travel outside the U.S. being outside the norm for people who live here. I live in southern California, and discounting travel to Mexico (which is less than an hour away by car), I and most people I know have never travelled to another country. I have no stats or anything to support this but I would also assume this holds true for much of the country. Something interesting to note is that a foreign language was also mandatory for me here stateside, but it was only two years, very few languages were offered, and it didn't happen until grades 9 and 10. It was treated as such an afterthought that what little knowledge stuck from these classes, slid back off pretty quickly. Conversations with spanish-speaking friends and coworkers has proven a much more usable education. I speak only English. However, I can just about manage shopping and getting a room for the night in French and German. As I now have a Japanese daughter-in-law I am trying to start a Japanese course - but I doubt, with so little language-fu to build on and the ravages of age on my memory capacity, that I will reach a useful level with it (however interesting I may find what I do learn). It seems to be. Even as an English native, I have forced myself to try other languages because they are so conveniently close! I can eke out enough French and Italian to be a reasonably self-sufficient tourist. I generally find that I can translate some simple written stuff in most romantic and West Germanic languages using common language roots which is handy and makes me look like I know a bit more than I really do. Perhaps more useful is that I find it really easy to interpret badly spoken English from non-native speakers. One thing I do pride myself on is being able to understand most of the dialect variations in the UK. The Yupik may have around 50 lexemes for snow but we have about the same for rain, or bread rolls for that matter. I'm a native Dutch speaker - well, Flemish, really, but let's not split hairs - and I speak fairly fluent French and English. I can manage fairly well in German, though it's a bit rusty from disuse. It helps that it's fairly close cousins with Dutch (Dutch, Deutsch, Theodisc...). I have some touristy smatterings of Italian and Spanish, and I'm trying to pick up Gaelic. Trying and failing, through unsteady application, but that's entirely my own fault. And then there's a few dead languages I used to read with some ease, but I haven't really practiced that in a while. In Belgium, we have 3 official languages, codified by law: Dutch, French, and German. German is a minority, compared to the others. As a result, we're taught - with varying effect - the other major language even before high school. Second year of high school, we're taught English, and people can take German from third year onward. Some schools offer other languages - like Spanish - as an extracurricular. I don't really have a view on what they're doing in the German speaking part of the country, but it's my understanding most go to French speaking high schools, which seem to have a fair number of Dutch students from across the border as well. In that region, you can hear a mix between German, French, and Walloon. As they're very friendly people, they'll often try to use whatever they know of your language as well, which, sadly, often does not help understanding, though kindly meant. I speak Mandarin Chinese, Shanghainese, bad Cantonese picked up since coming to Australia, a smattering of Japanese and Korean, and English, of course. Is there much commonality across the Chinese and neigbouring languages like there is for romantic, Germanic/gothic and Scandic languages? Let's see, English obviously. Small bit of Irish, not enough to have full blown conversations but enough to just pick up on what people might be saying. Learned German in school, brushing up on that and learning Spanish. Smattering of French and Italian. And years ago, I tried my hand at learning Finnish. Nearly went insane do that. Intrestingly, Japanese and Korean are both in a separate category by themselves. Chinese and neighbouring languages do form a family, like the Germanic and Romance languages: the Sinitic languages include Mandarin, Cantonese, and Hokkien. On one remove, there is the larger Sino-Tibetan family, analogous to the Indo-European, containing Romance, Germanic, Slavic, and Indic families, that includes Thai and Burmese as well. I'm no sinologist, so I'm fairly sure I'm forgetting quite a few related languages. In all, that would indicate that there is a certain degree of commonality, though with relative distances between the languages, much like is the case in our Indo-European group. Just english for me, but I wanna learn French and Japanese. My computer is filled with pretty much every single quick guide, walk through, or learning software I could get my grubby little hands on from the library, but I have yet to touch any of them. Cornelius's post covers this comprehensively from a linguistic point of view, but there is the cultural complication of written language. Imagine if French, German, English, Spanish and Italian all shared a common written language, so that people could not understand each other's speech, but could communicate freely in writing. That is essentially the situation with Chinese languages. Cantonese and Shanghainese, for example, are mutually incomprehensible, but speakers of these two "dialects" can communicate in writing. Owing to the immense cultural influence, over thousands of years, of China on its neighbours, many Chinese words were adopted into the languages of its neighbours, and Chinese writing was adopted by many neighbouring countries to write their own languages (however poorly it "fitted", linguistically). Japanese kanji, Korean hanja and Vietnamese chữ nôm are all examples that remain in use to varying degrees, despite being largely replaced (or at least supplemented) by writing systems better-suited to the languages in question. To someone who knows Chinese, these can be useful, since many characters have the same meaning as in Chinese, however different their pronunciation in the local language, but they can be "false friends" too, because sometimes their meaning has changed substantially over centuries. Practise and persistence makes perfect. Start now! Seconded. Also, it's intimidating to think of learning something, especially something difficult like picking up a language. You put it off again and again. It's a good idea to just decide to learn for 10-15 minutes every day. It's relatively easy to find the time, and istead of the intimidating "I have to learn an ENTIRE language", it becomes "just 10 minutes". And all the days you would otherwise put off the starting point, multiplied by 10 minutes, will add up to a lot. Mandarin Chinese: recently started trying to learn, currently still at the "我不是猫" level. I was taught French for three years and German for five. The French didn't stick at all but I miss understanding German. I've been on/off relearning using Duolingo but haven't made great progress. Bengali is interesting to me. Could you say more? German, English, (very rusty) Dutch and remnants of school-French. Can't speak for the rest of Europe, but from what I've heard, yeah - there tend to be at least a few years of foreign language classes in schools throughout European countries. Norwegian (bokmål) native, fluent in English. Took Italian classes for a year but I was lazy and nothing stuck.